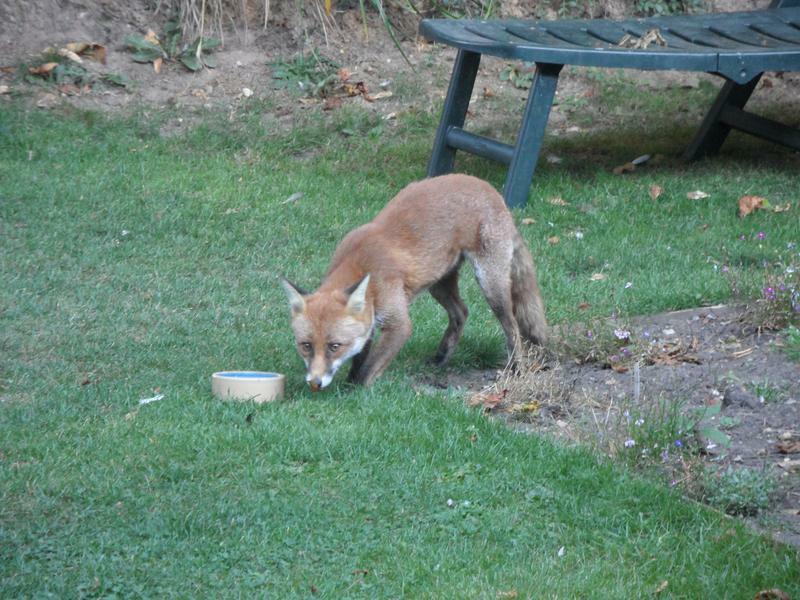 Photos from the garden in 2012 of birds, foxes and other wildlife. 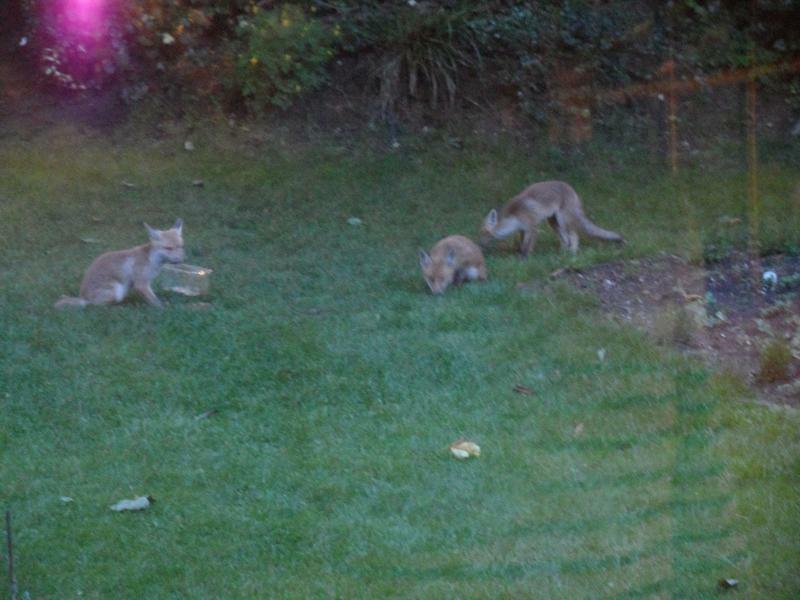 Fox cubs have started visiting the garden this year. 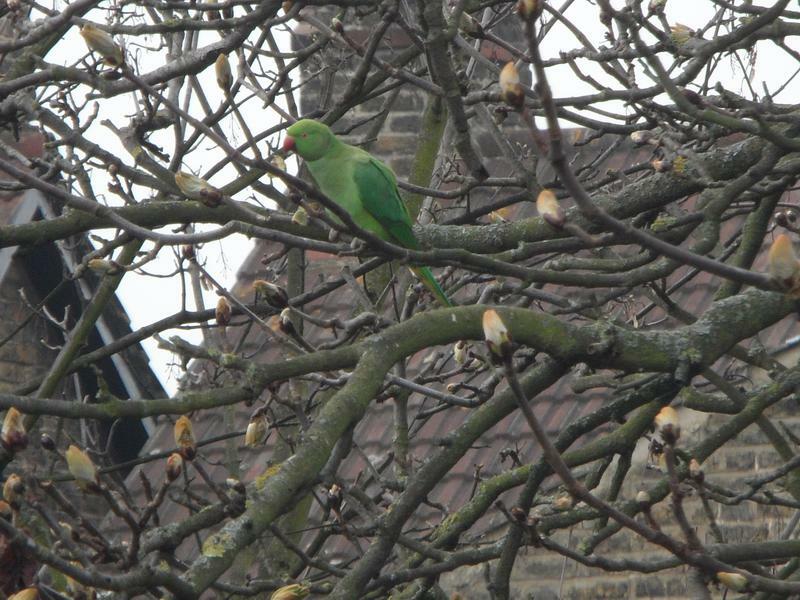 13th March 2012, seeing occasional visits from one or two noisy Ring-necked Parakeets (or parrots), also seen in two local parks. 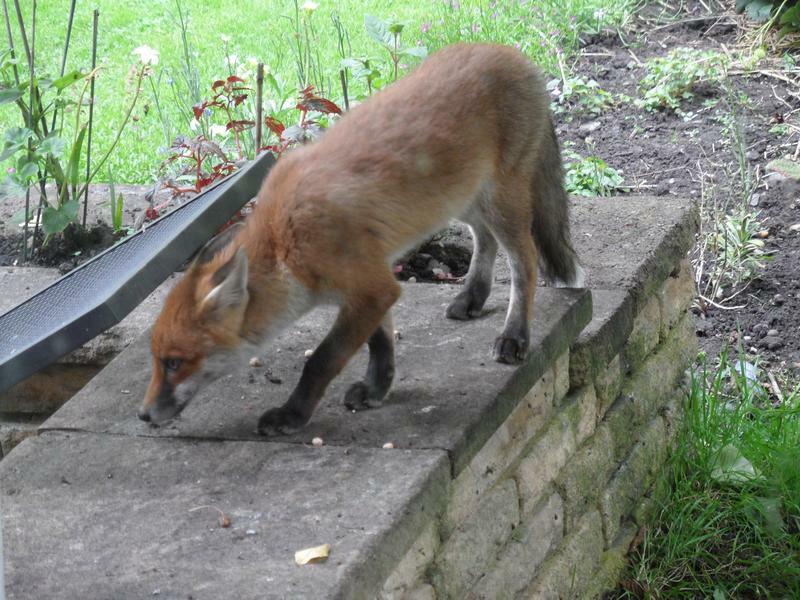 get at the food either. 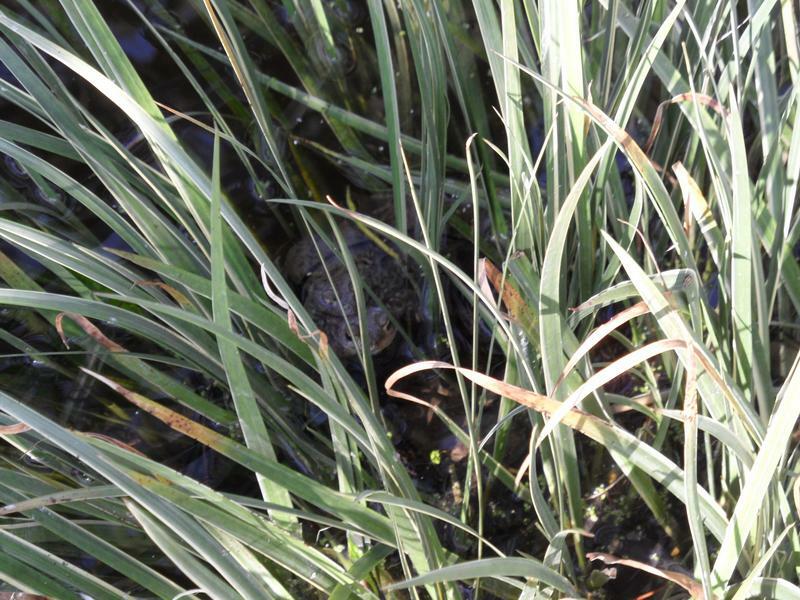 year there seem to be at least 10 frogs spawning, some seen here with the strings on toad spawn underneath. 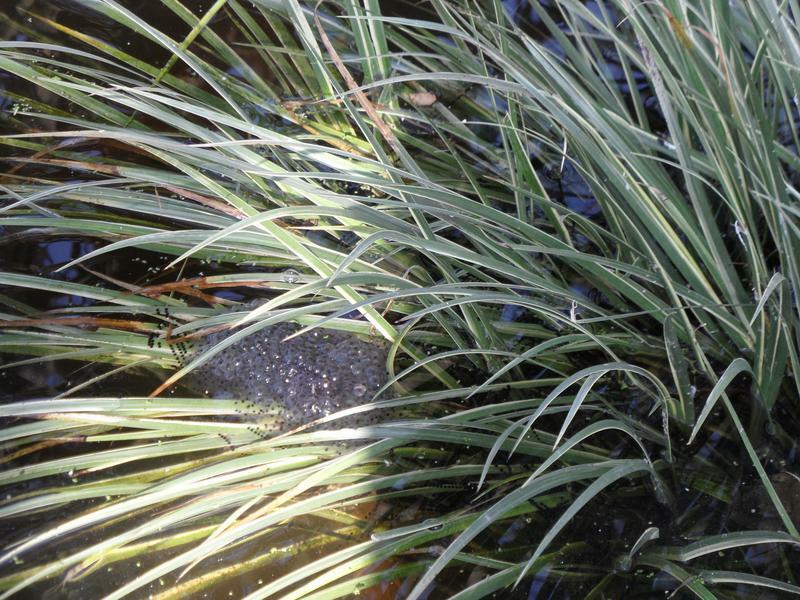 A mating pair of toads in daylight, quite dangerous for them if spotted by the crows. 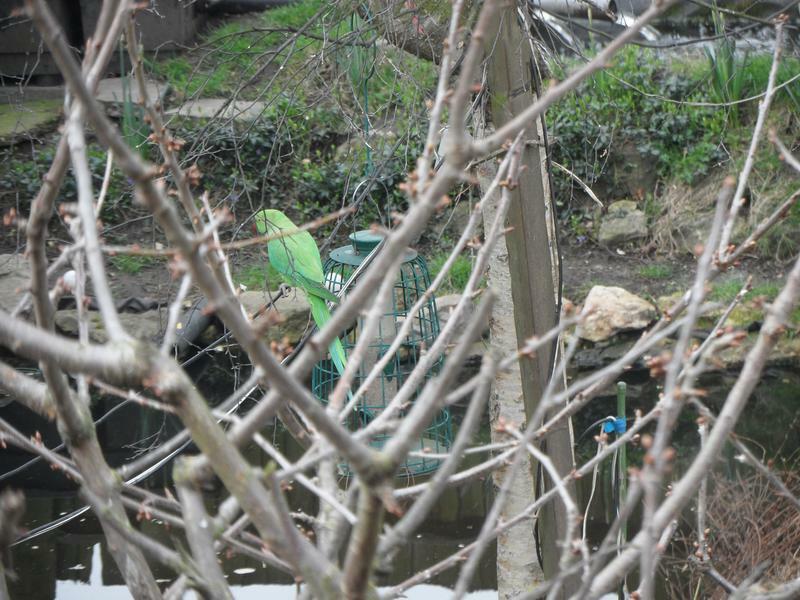 16th April 2012, the Ring-necked Parakeets are back again briefly, no long enough for the camera to focus properly. 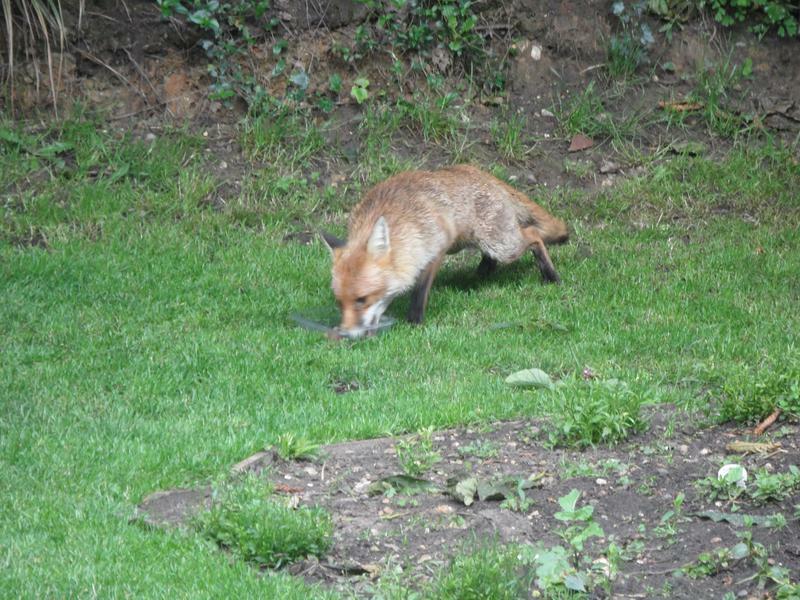 28th April 1012, two foxes are visiting the garden each evening about 8pm looking for food, here eating some bread left by the birds. 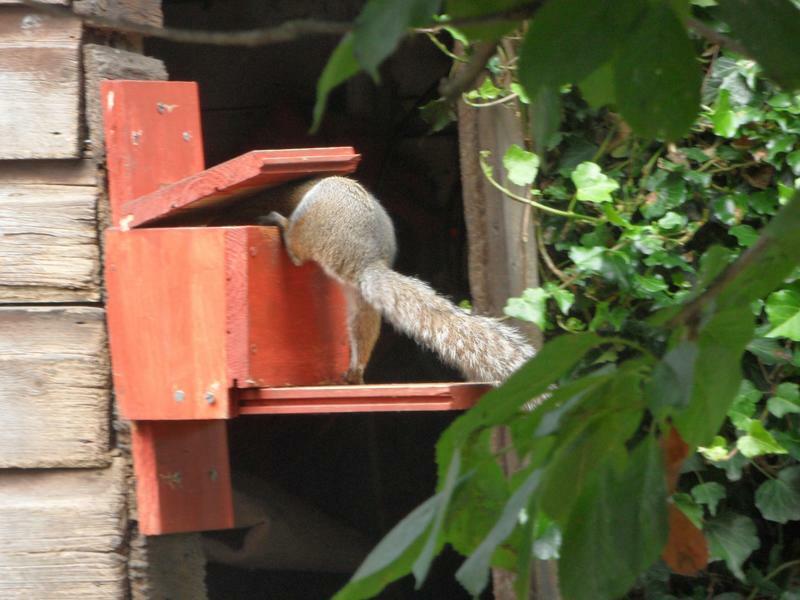 5th May 2012, one of the boxes eating dog biscuits. 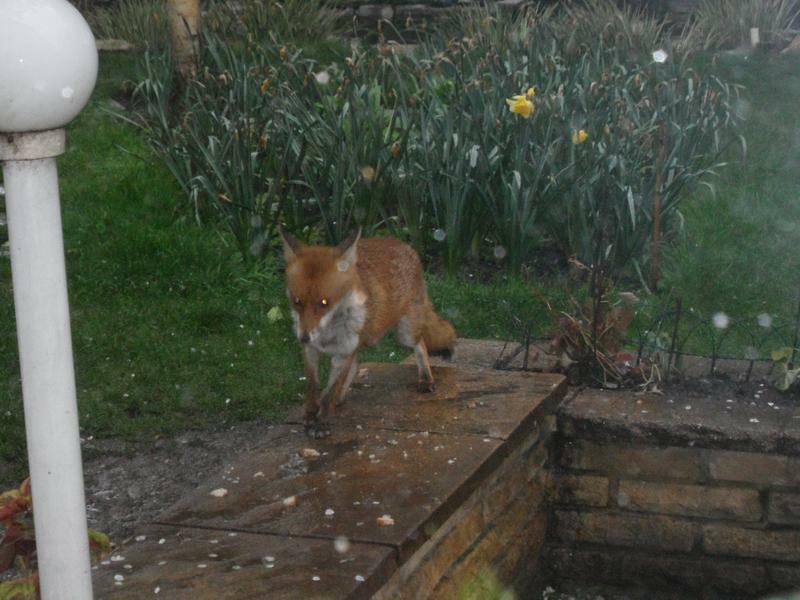 17th May 2012, the fox is still coming for dinner each evening, and eating any bread the birds have left. 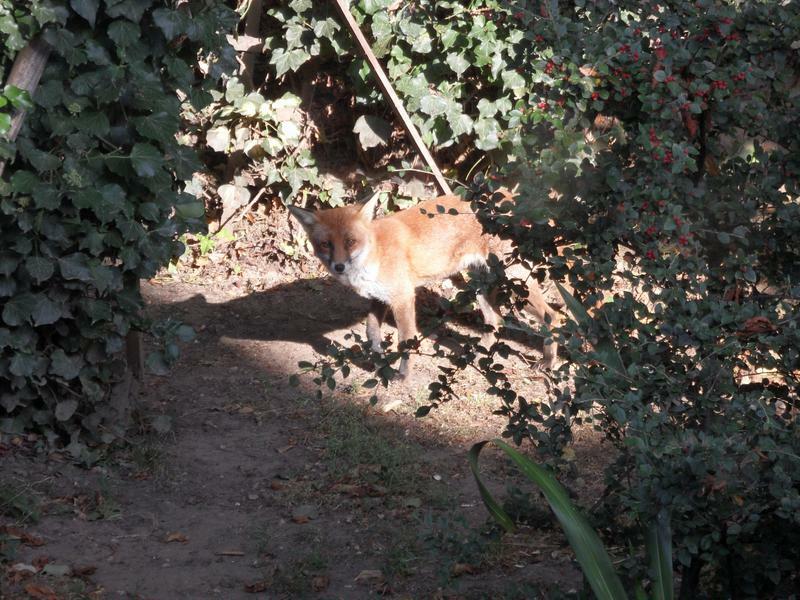 is why Simba the cat was sitting by the pond above. 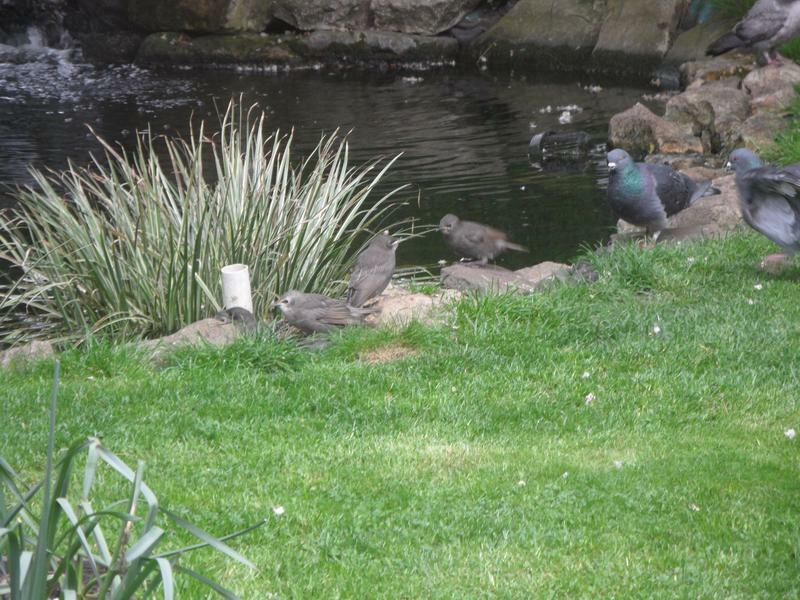 They were eating three loaves of bread a day this week. 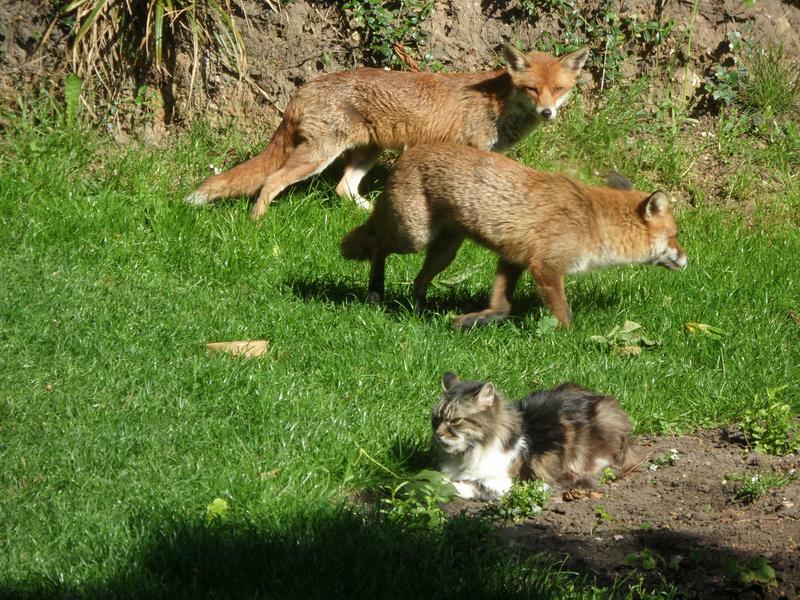 25th May 2012, it seems there are now two mothers coming to feed twice a day, here watched by Susy the cat at 9am. 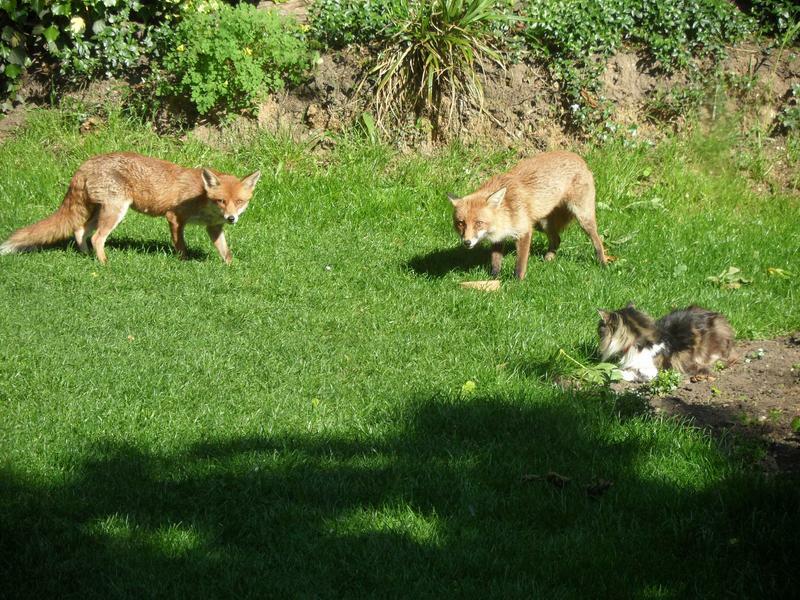 The foxes seem to get on well together, no fighting, but they usually head off in different directions perhaps to different dens. high and visibility is zero. 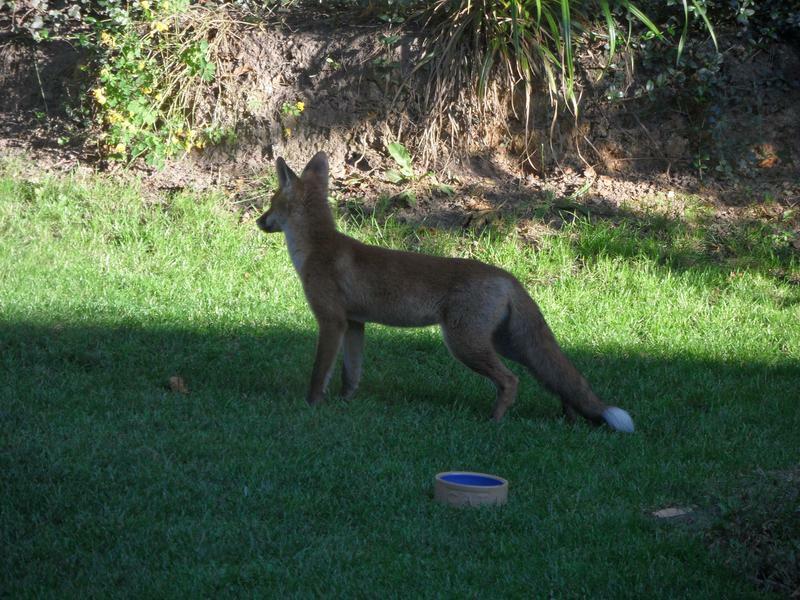 The mother fox is still visiting the garden morning and evening. 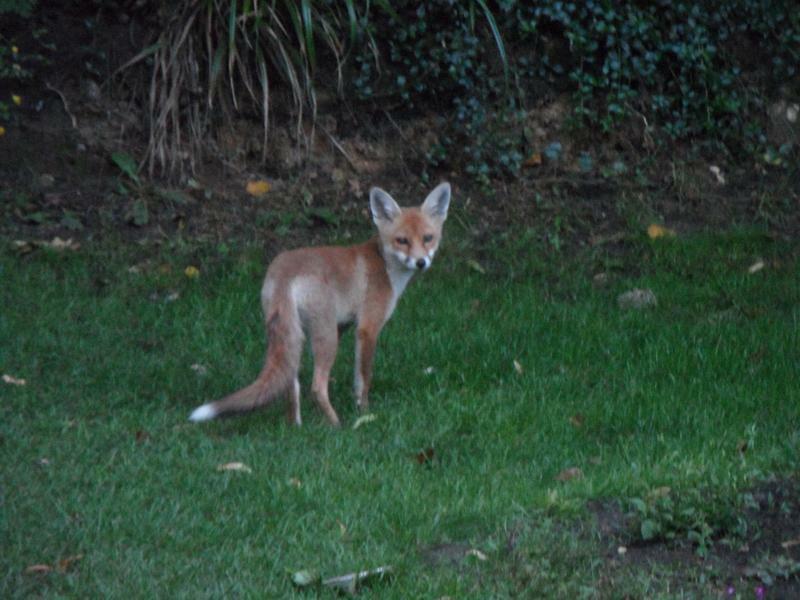 is close by, but not taking much notice of the cubs, difficult to know if it's their mother. 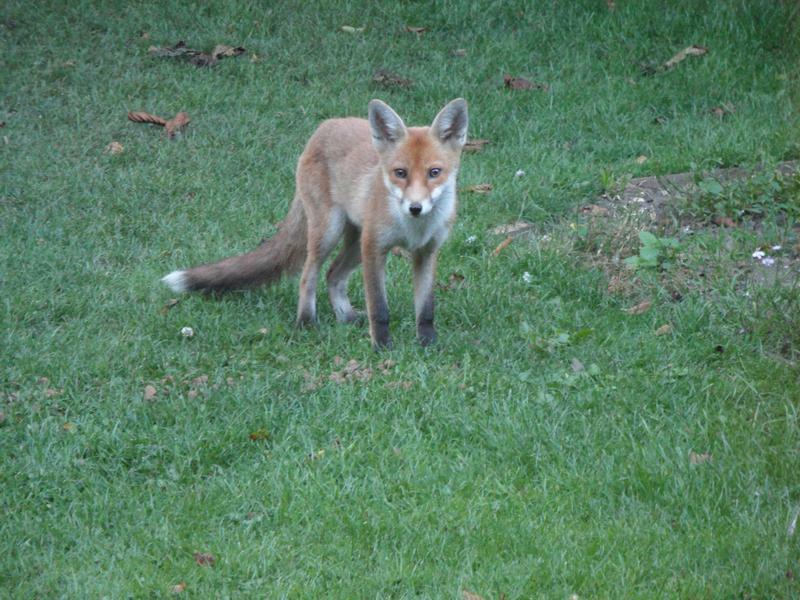 The fox cubs are very timid, jump at the slightest sound in the road or garden and run back to the safety of the hedge. 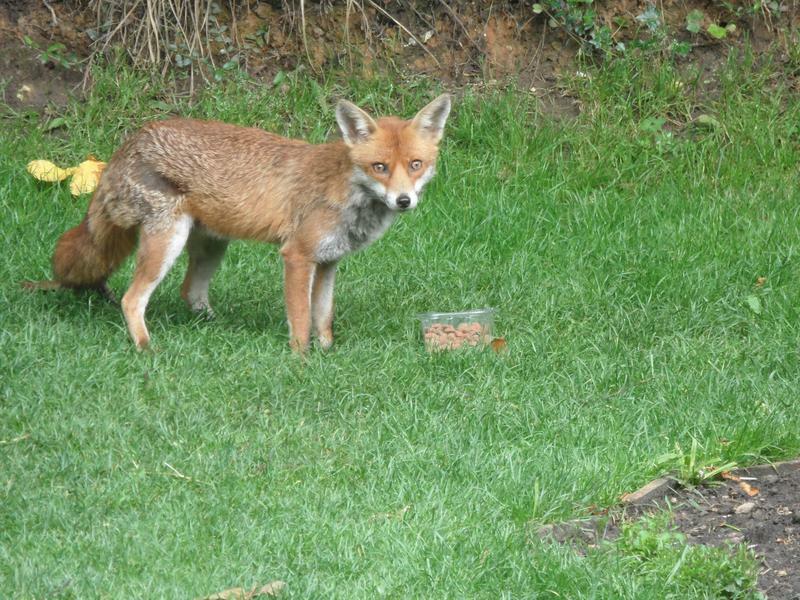 This first night there was only one food tray and this cub ate the lot (I refilled it later), so now putting out two trays. 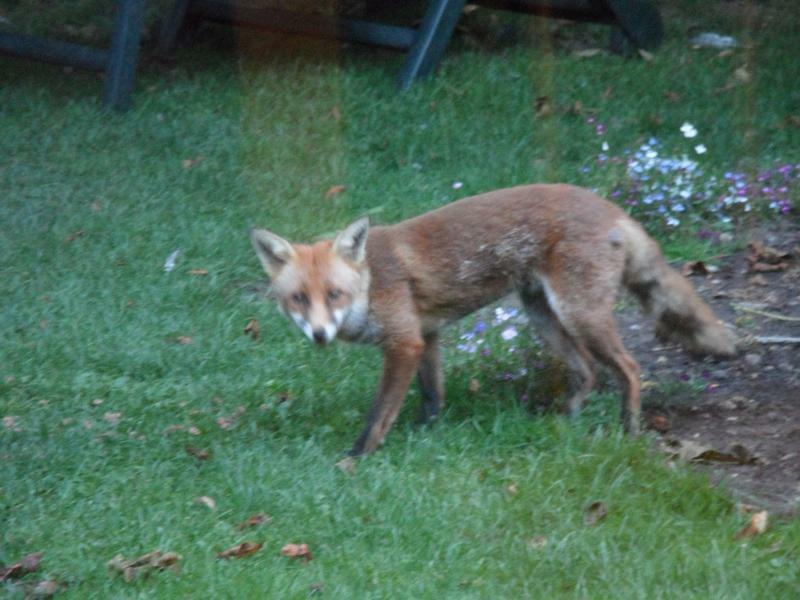 The cubs seem in very good condition. 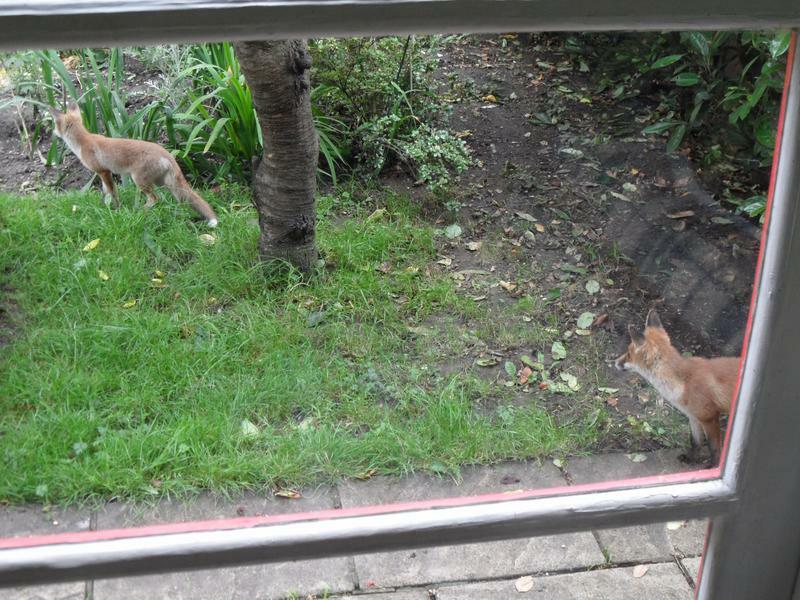 The fox cubs are drinking from the pond, and watching the ducks. 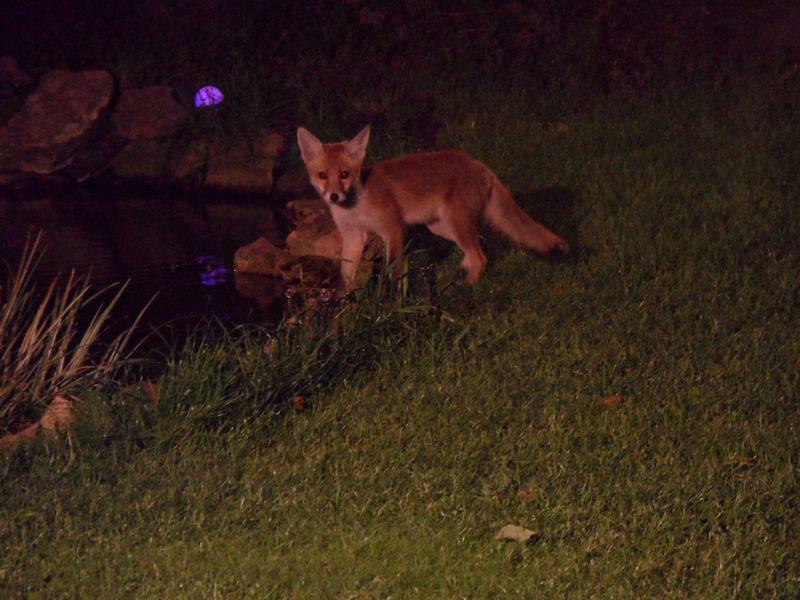 The next night only a single cub came back before it was too dark to take any more photos. 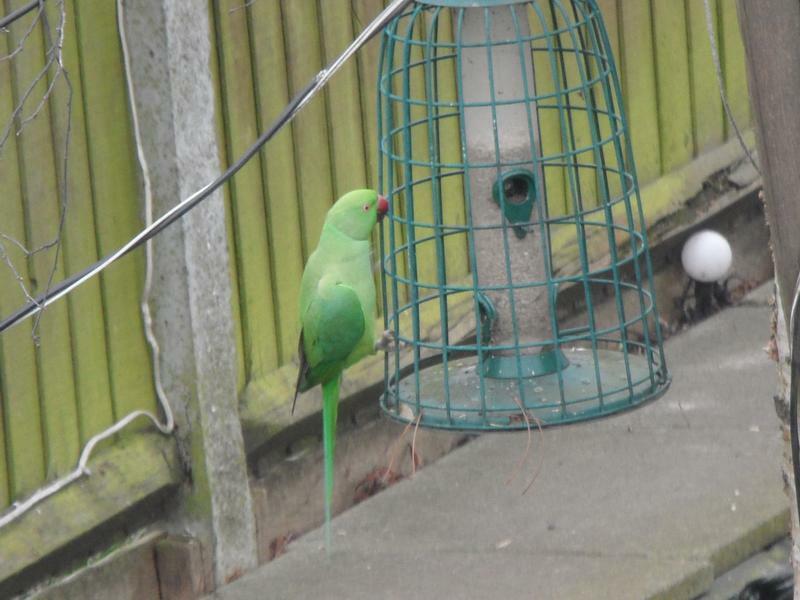 Mother is still coming back each morning, it the crows have not eaten her pellets first. 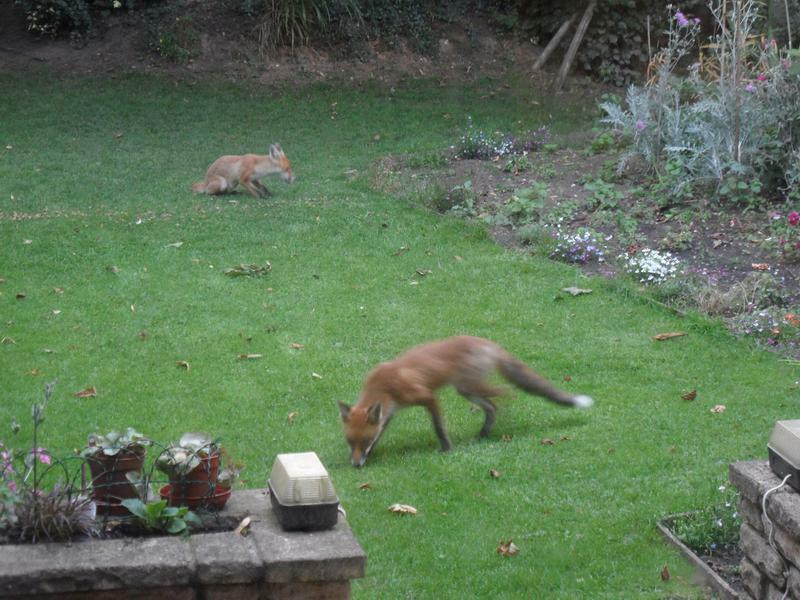 Not seem the cubs in day light yet. 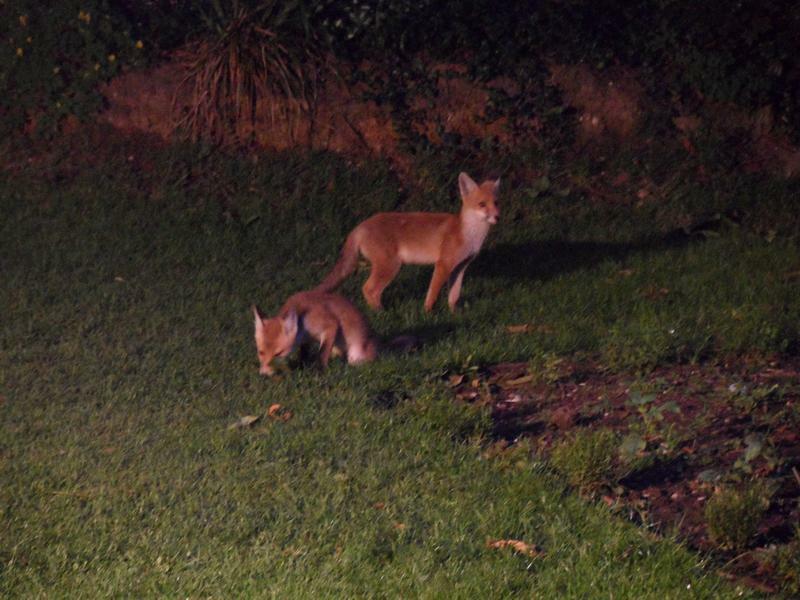 The fox cubs are still coming back each night, now illuminated by a spot light so better photographs. 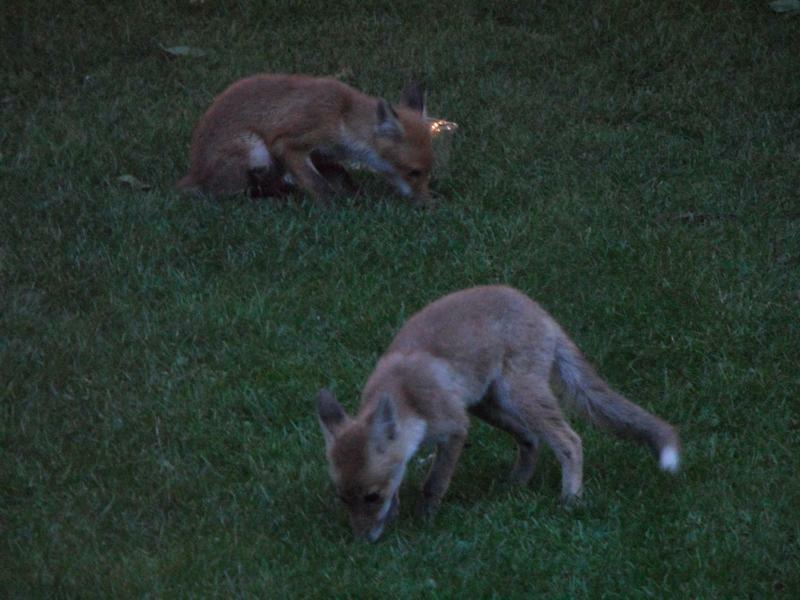 Two of the three fox cubs, the only time I saw all three together again they saw me move toward the window and ran off. 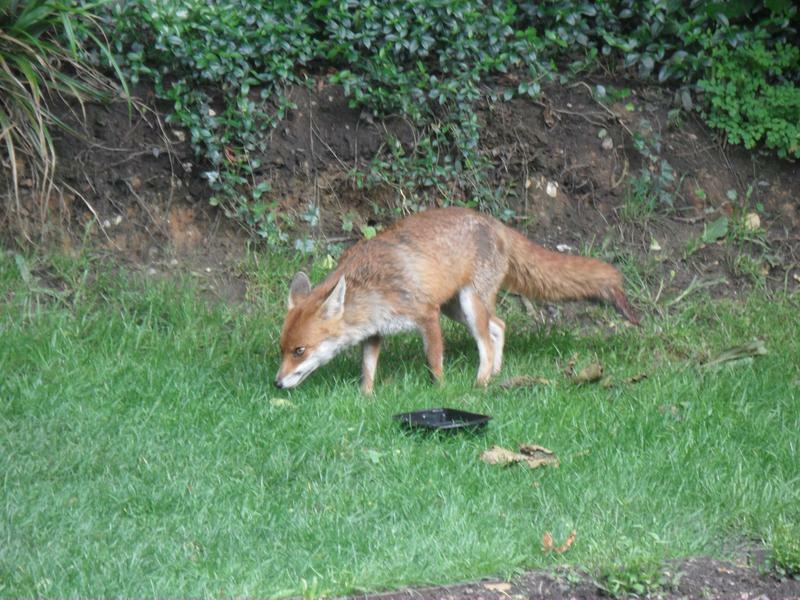 One of the cubs drinking from the pond. 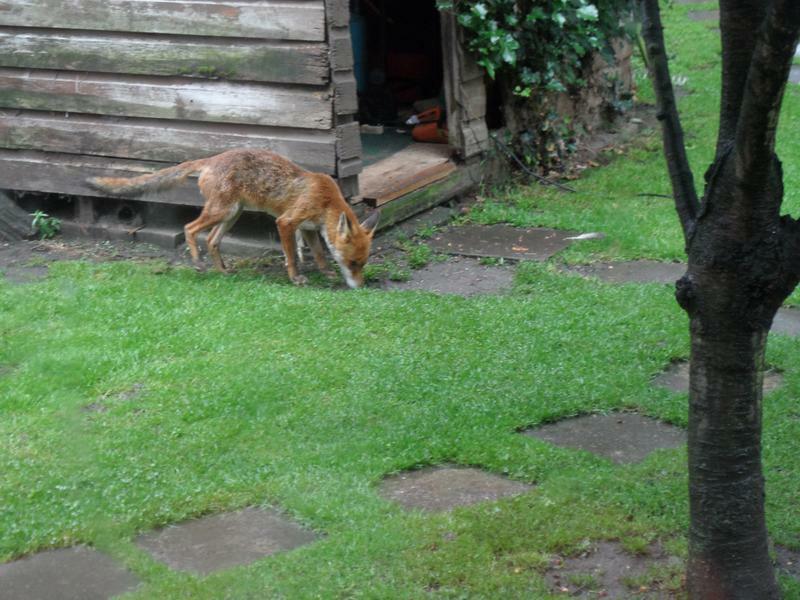 Mother still explores the garden and shed for food. 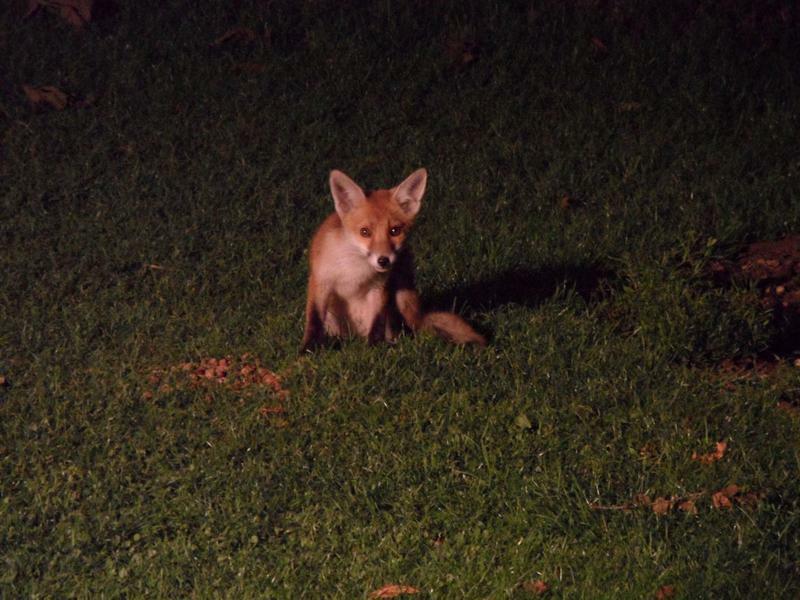 30th June 2012, just one cub tonight, and past 10pm. 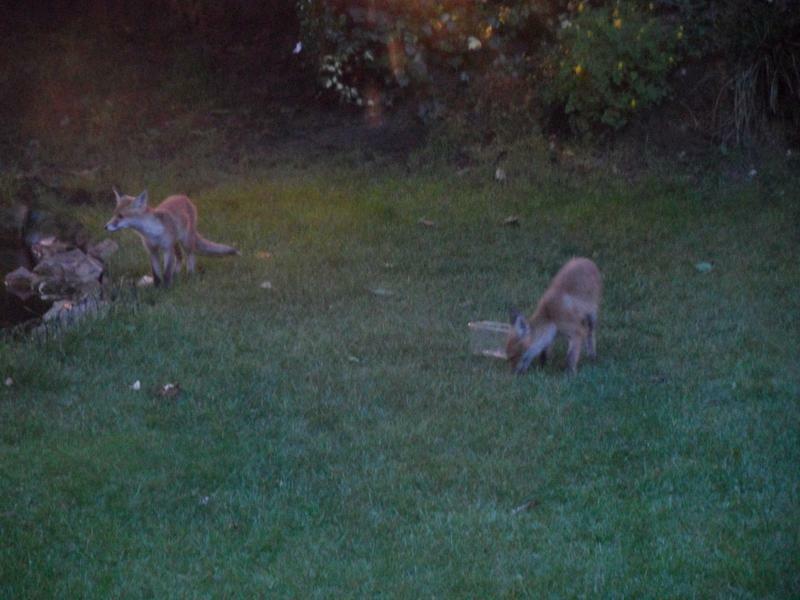 4th July 2012, 9.15pm, the fox cubs are growing larger, even in the two weeks they've been visiting the garden. 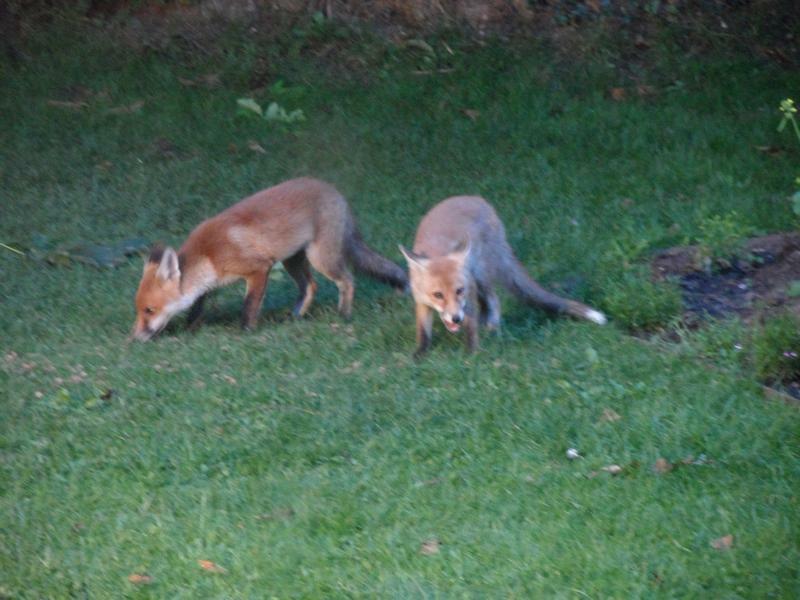 fox cubs, but did not manage to photograph all three together. 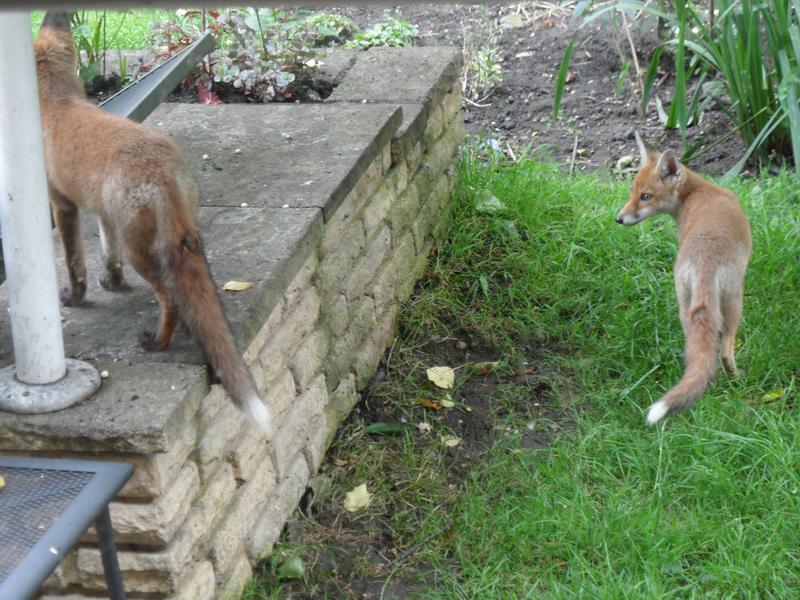 7th July 2012, 8.30am, got a surprise this morning, first day light visit from the fox cubs, looking for fallen cherries. 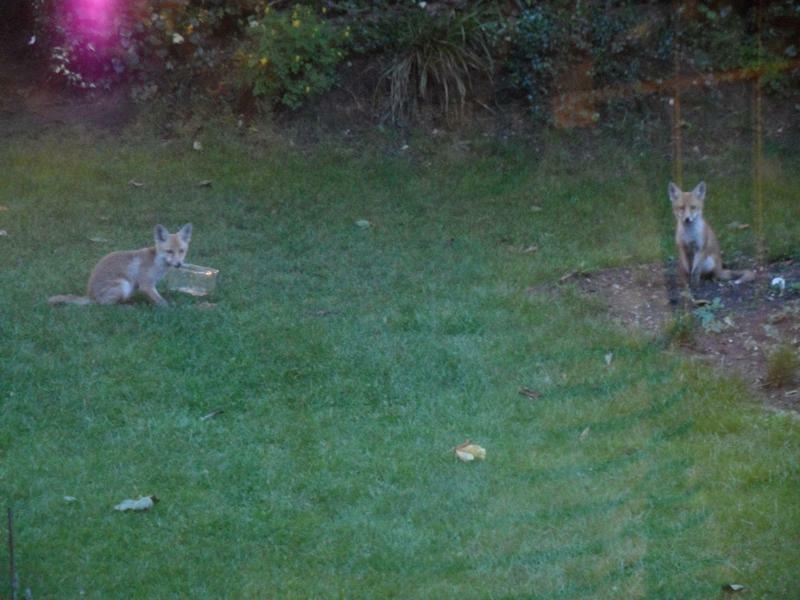 I was taking photos for about five minutes, and they did not see me watching them from the window. 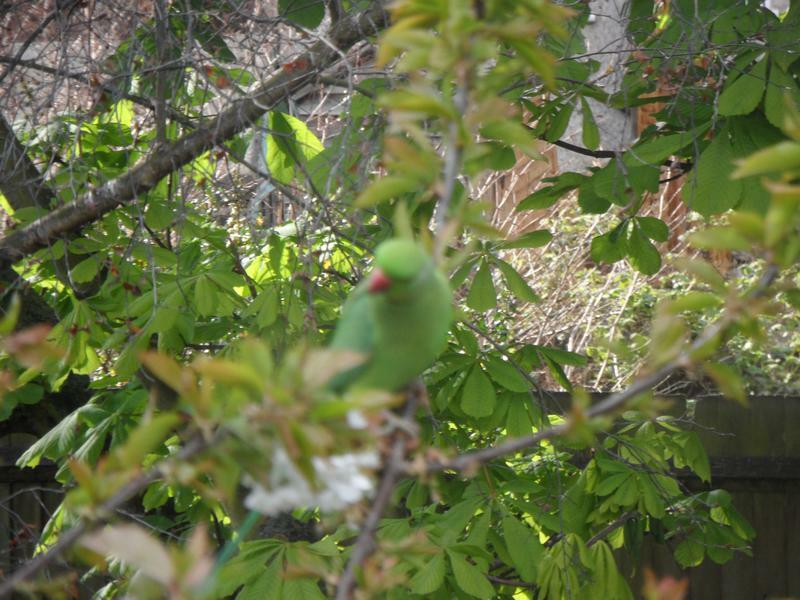 Eating a cherry on the patio wall. 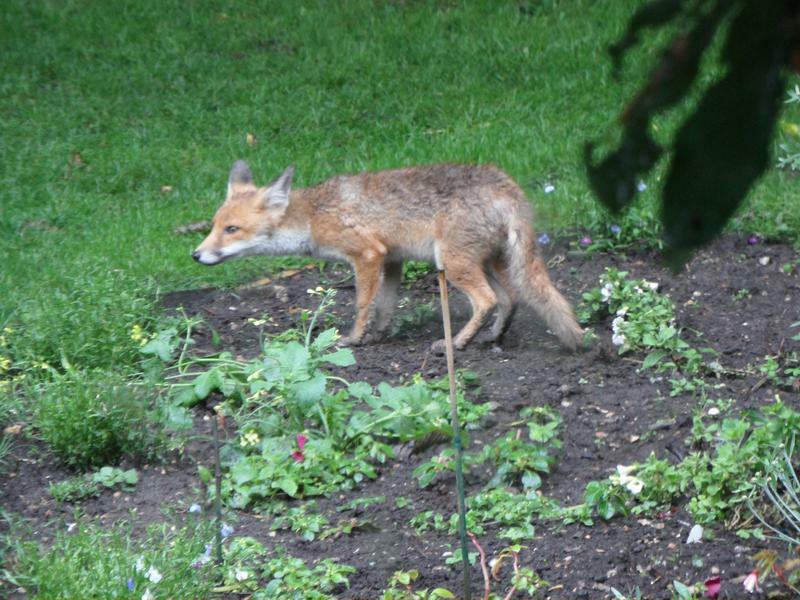 Watching for danger in the garden, but not looking at the house. 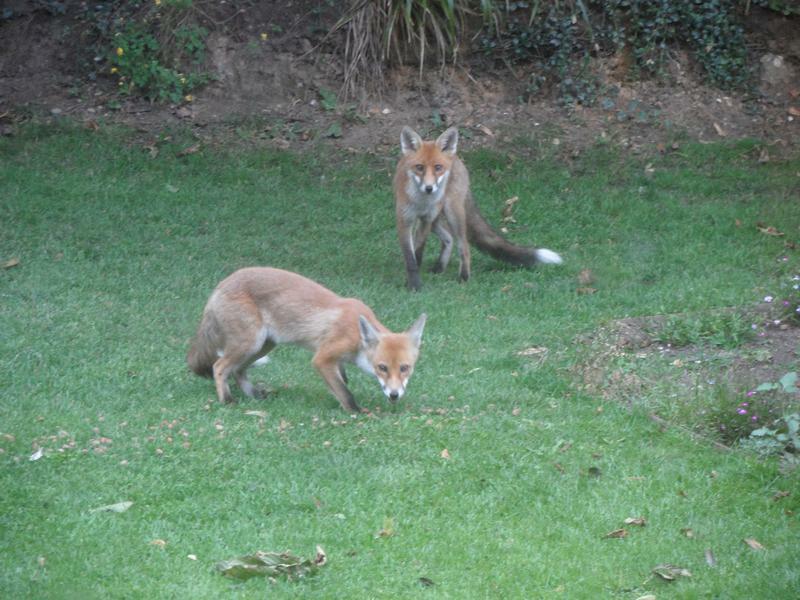 They still seem in very good condition, although their mother was limping on three legs the previous evening. 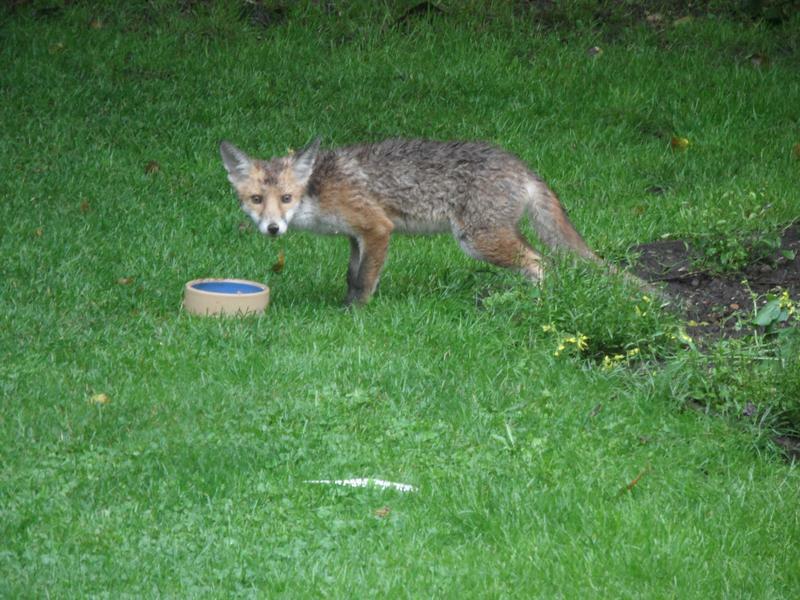 8th July 2012, 9am, I think this is one of the fox cubs, but soaking wet from heavy rain overnight. 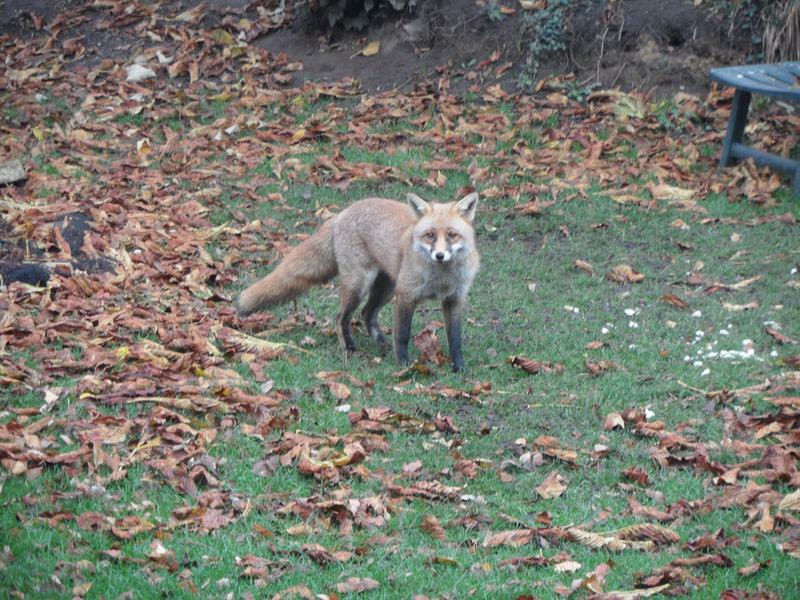 Another morning visit. 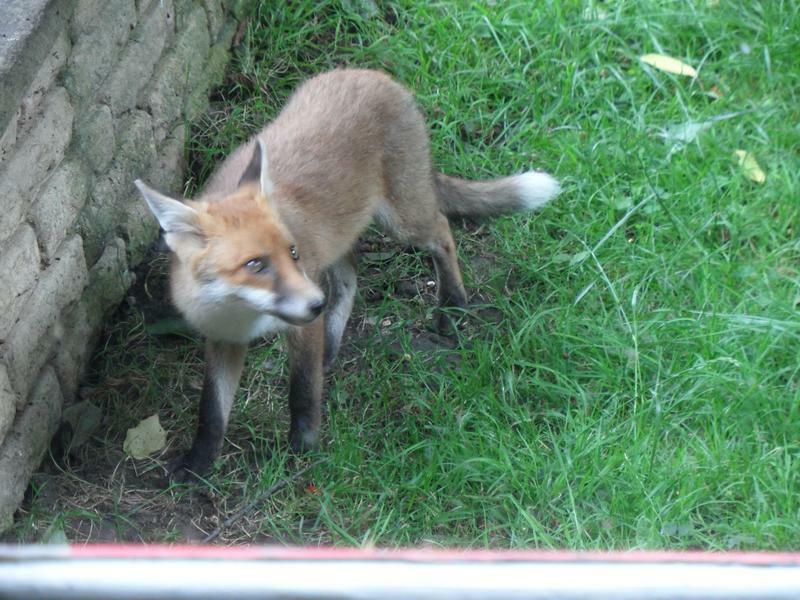 A second cub at the same time, looking a little drier than the first. 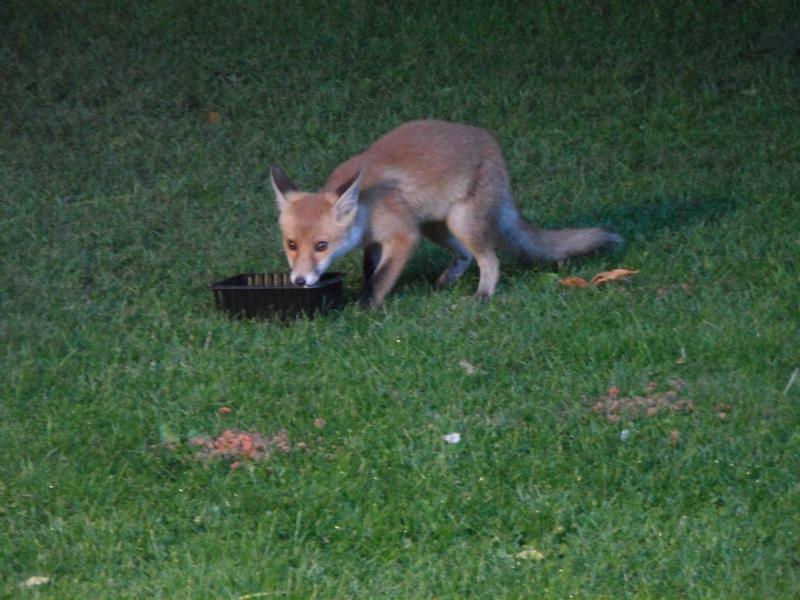 20th July 2012, one of the fox cubs waiting for dinner. 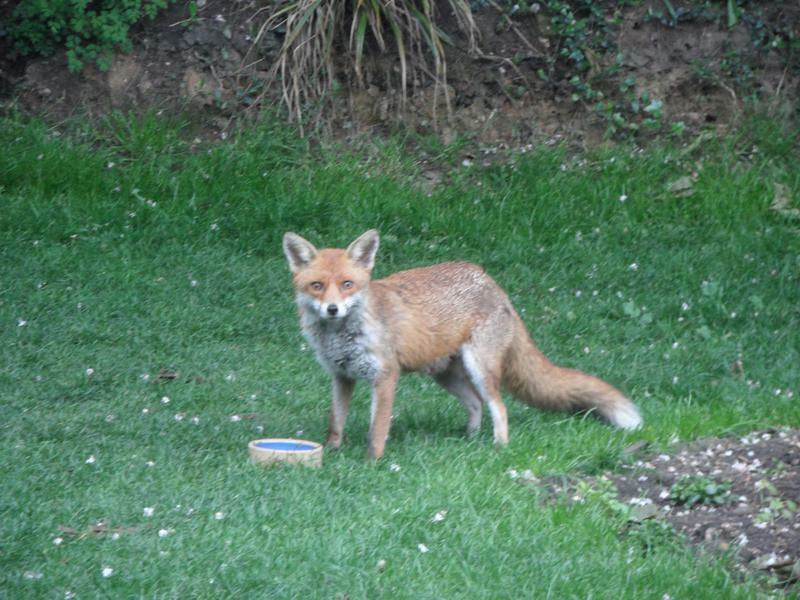 24th July 2012, some morning they get cat food left over night that's put out for the birds. 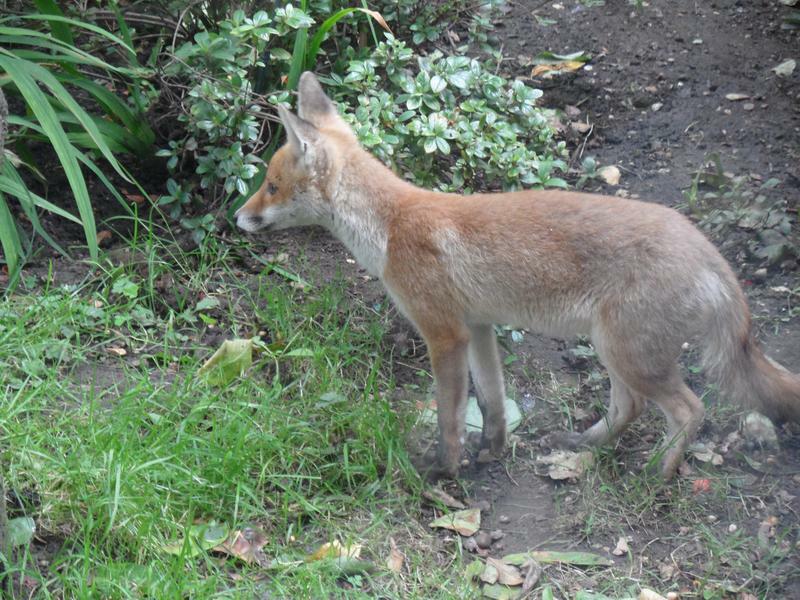 The increase in height in just one month since I first saw the cubs is significant, lots of dog biscuits has helped. 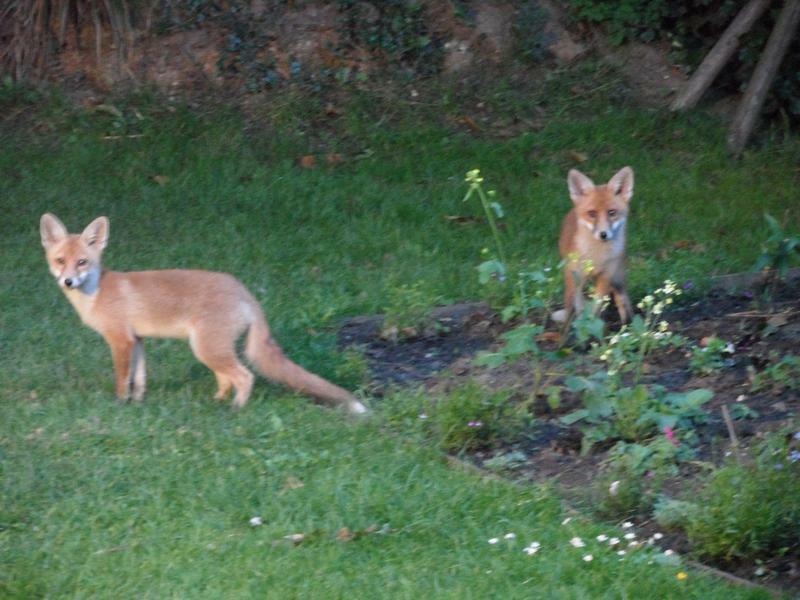 30th July 2012, about 8.30pm one cub watched by the mother. 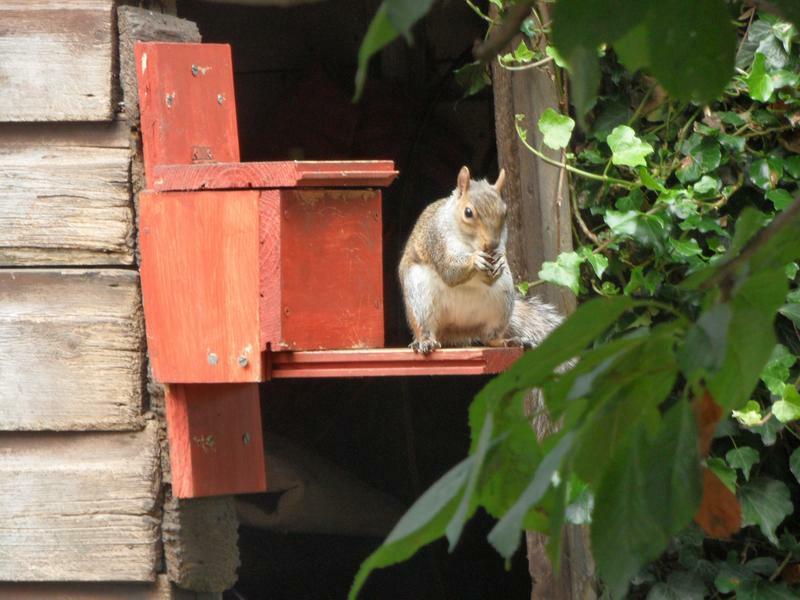 Currently about five squirrels feeding here, but no idea where they live. 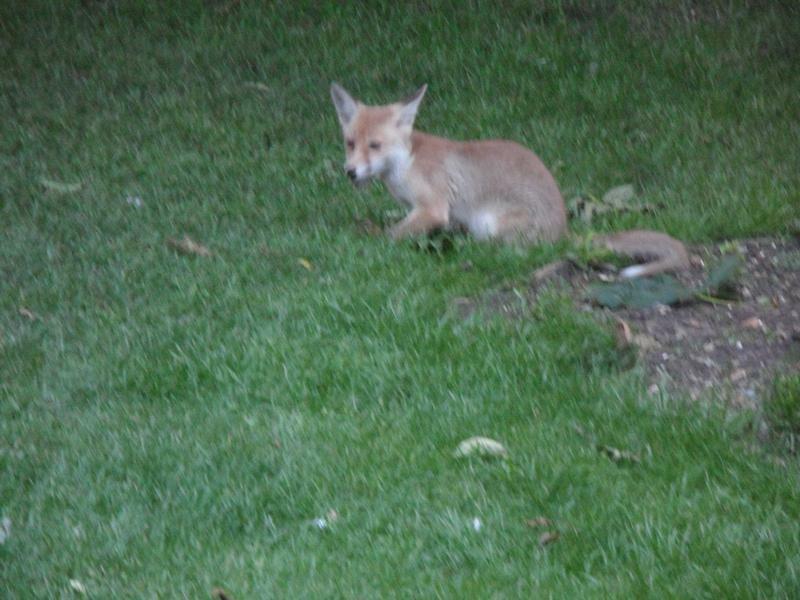 3rd August 2012, one of the fox cubs pondering the dig biscuits on the lawn. 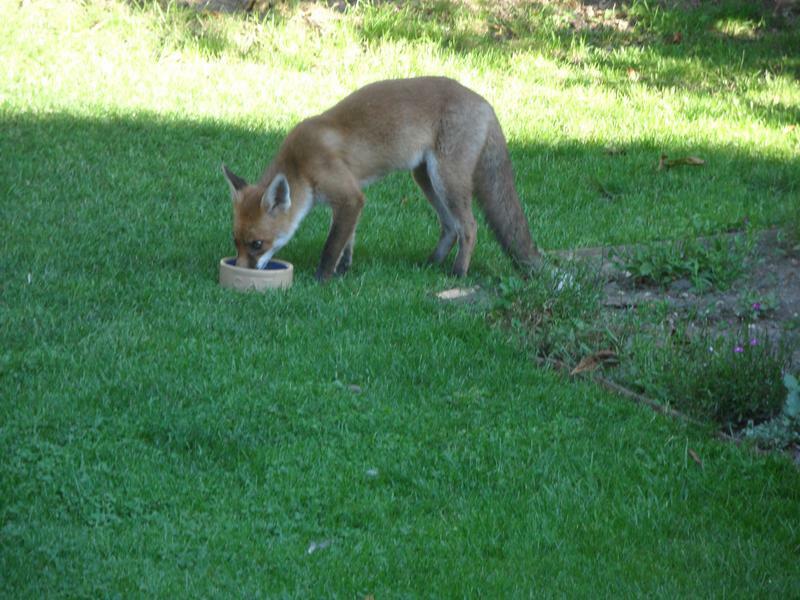 Some days they get left over cat food as well as dog biscuits. not tell if it was from her family. 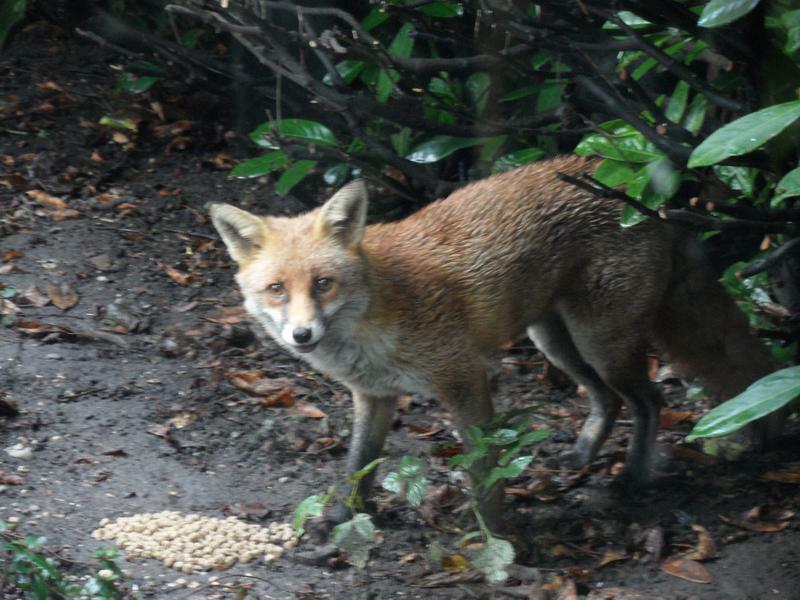 Cars are the major cause of urban fox deaths. 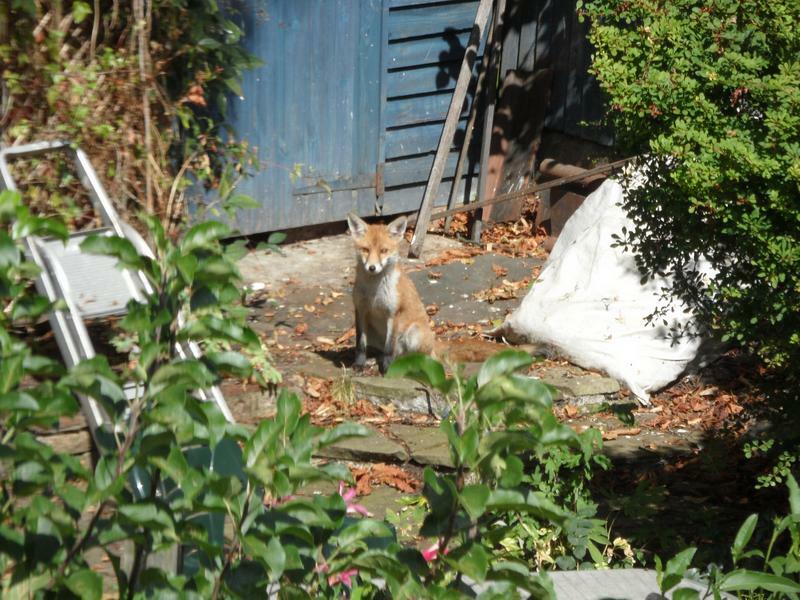 Mother at midday, taking in the sun in the next garden. 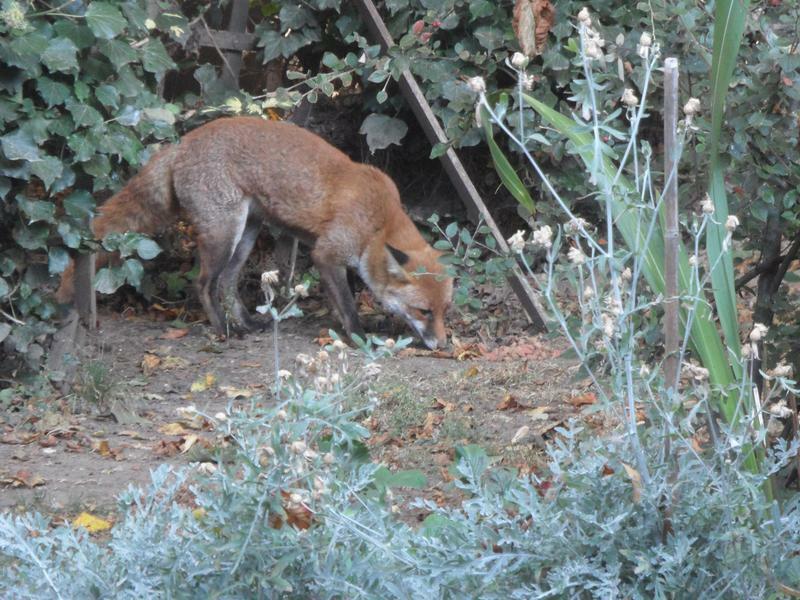 Another fox was sleeping in a nearby flower bed. 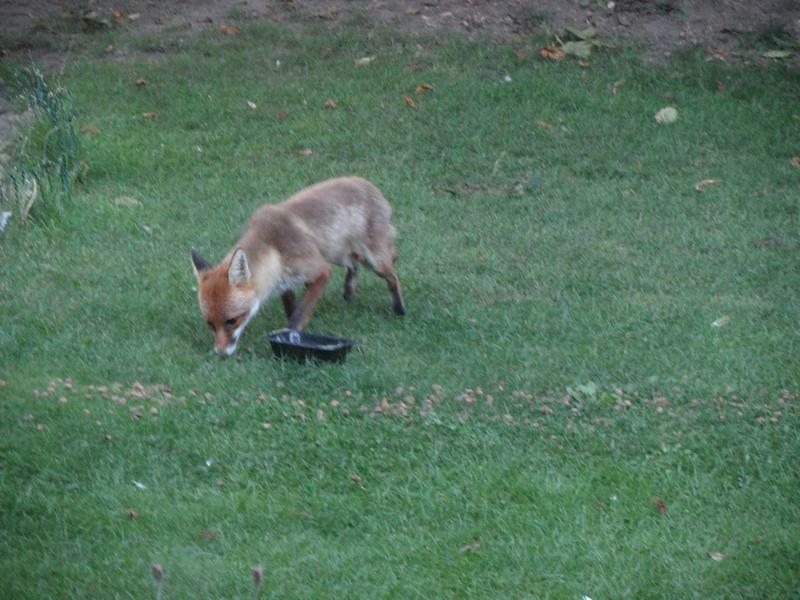 September 2012, early morning, a fox cub gets to the crows breakfast before they do. 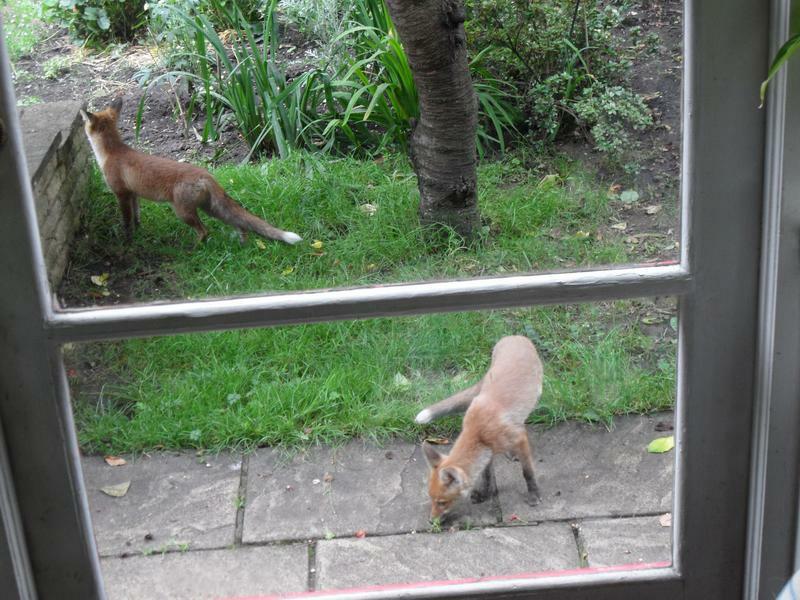 Waiting in the morning for breakfast. 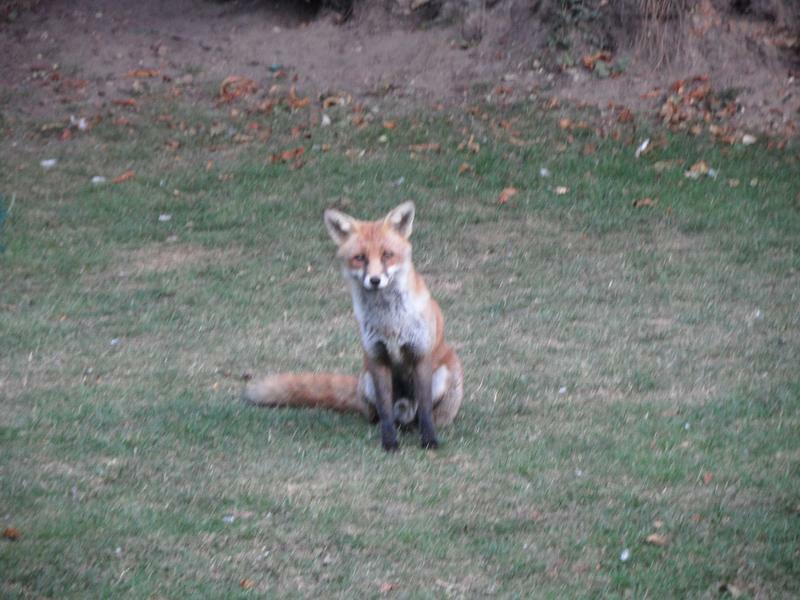 7am, sitting in the middle of the lawn staring at the kitchen window again waiting for breakfast. 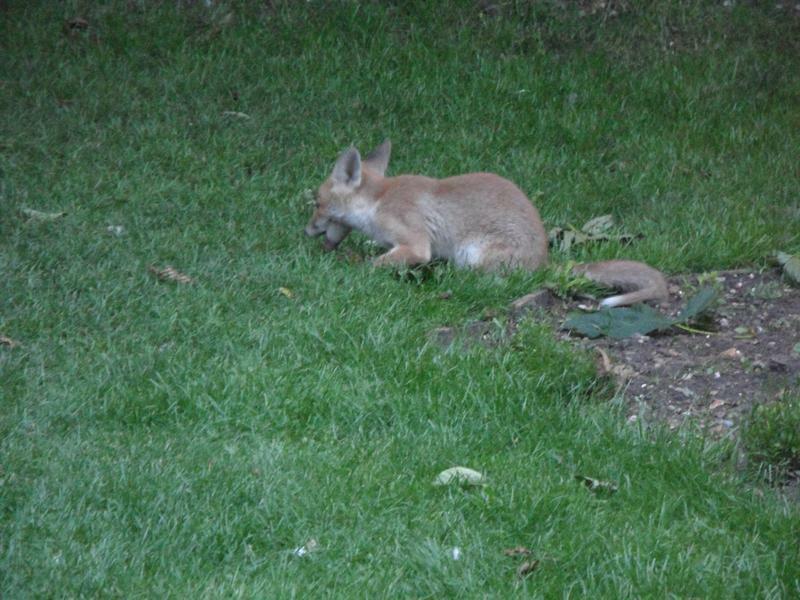 A cub eating dog biscuits at the end of the garden. 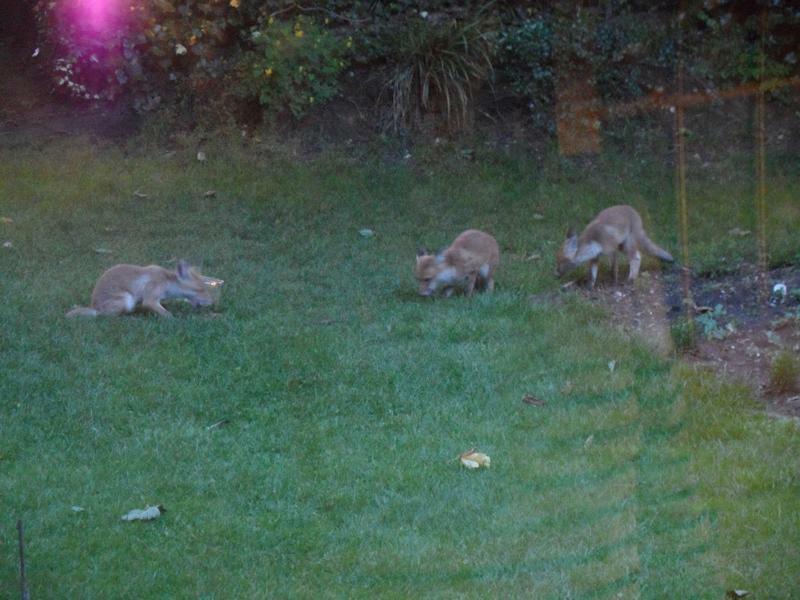 November 2012, the cubs seems full sized now, and at least one still comes back at dawn and dusk for dog biscuits. 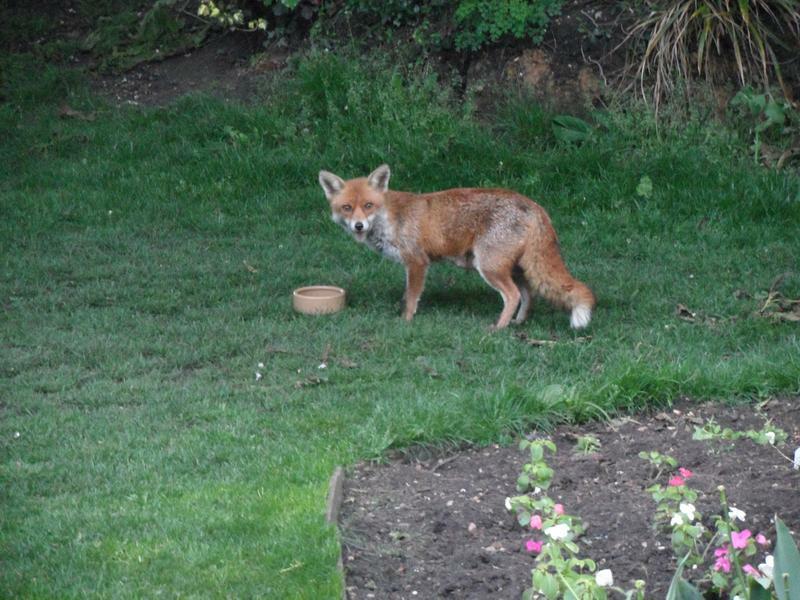 Waiting for food again, not interested in the bread.